King David is said to have had multiple wives, “cementing his relations with various political and national groups through marriage”. (Wikipedia) Inevitably, discussions and posturing with regard to who would be the next king grew as David became old and weak. David was greatly distressed and assured Bathsheba that, “As certainly as the Lord lives, he who has rescued me from every danger, I will keep today the oath I swore to you…”. (1 Kings 1:29-30) David then called the priest Zadok and the prophet Nathan and ordered them to anoint Solomon, king of Israel, immediately. 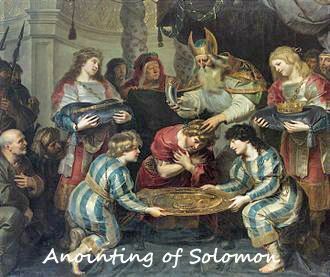 God appeared in a dream to Solomon soon after he was anointed. He said, “Tell me what I should give you”. Solomon replied, “Give your servant a discerning mind so he can make judicial decisions for your people and distinguish right from wrong”. (1 Kings 3:5, 9) God was pleased with Solomon’s wisdom. When he awoke and realised it was God who spoke to him, he went to Jerusalem, stood before the Ark and gave thanks to God. Solomon’s wisdom was often tested! Once two mothers came to Solomon to settle a dispute. Each had given birth to sons at the same time but one died. They both claimed the living child with one saying that the babies were switched at nighttime when she was asleep! Solomon listened to them and then ordered the living child be cut in two, a half each! Immediately, the real mother objected while the lying mother agreed! The child was returned to its true mother. 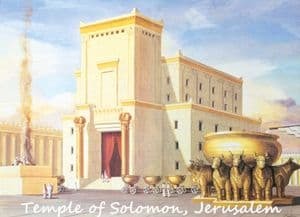 King Solomon is famously known for building the temple in Jerusalem with the Ark of the Covenant placed in the holy of holies. The temple was huge for its time, measured 90 x 30 and 45 feet high. It was built from a mixture of solid stone, cedarwood and precious metals with ornate structures throughout. King Solomon reigned from ca 970-931 BC. Sadly, people often admire great Temples, Churches and other buildings for their architectural prowess rather than their Sacredness! where I can be safe from the storms of sin and conflict. Show me the course I should take. so that I can always see the right direction in which I should go. in your name, we shall find comfort and peace. On this day in 1862, thirty-eight native American Sioux prisoners were hanged in Mankato, Minnesota. They were convicted of serious crimes against humanity!